Creative Destruction brings the unending fun of battle royale genre to mobile phones with style. 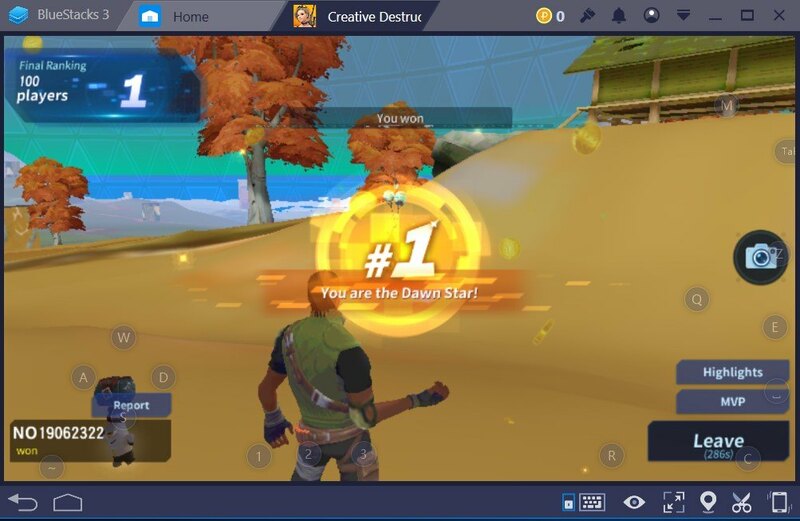 Even though it might seem like a mere copy of Fortnite, Creative Destruction has its own special ingredients that result in a well-cooked mobile game. Like all Battle Royale games, Creative Destruction has a lot to offer. Taking all that Creative Destruction has to offer might feel cumbersome and repel away some of the new players. 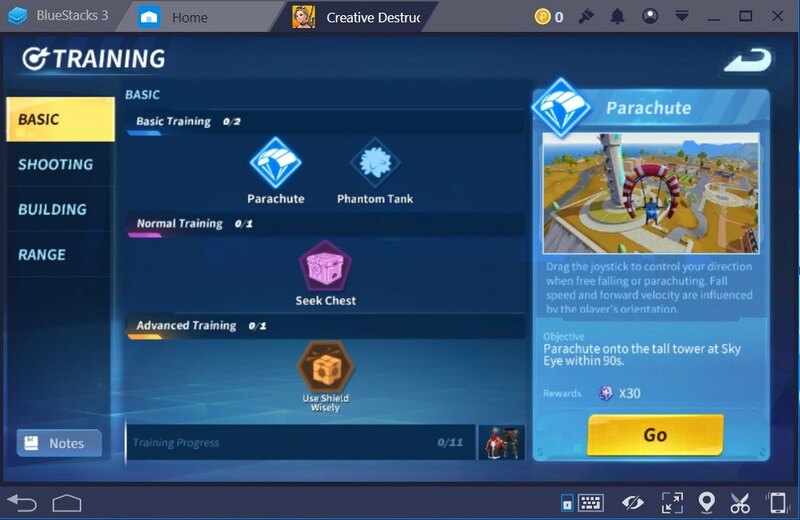 With this article, we will share some of our best tips and tricks for the game and make sure everybody enjoys Creative Destruction to the full extent. 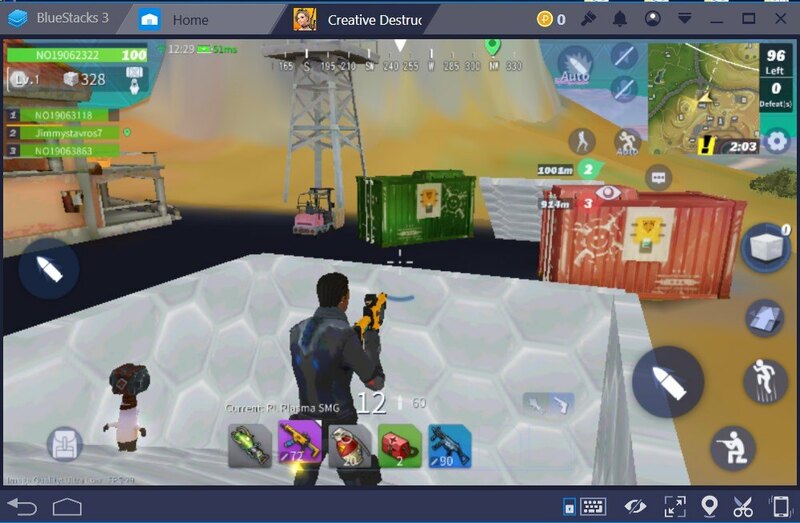 We told you that Creative Destruction looks like Fornite beforehand. That means like Fornite, you have to build in this game, too. We already know how hard it is to play a shooter game on your mobile phone, that’s nothing new. Add building to the mix and you have game in your hands that will require a ton of different controls. 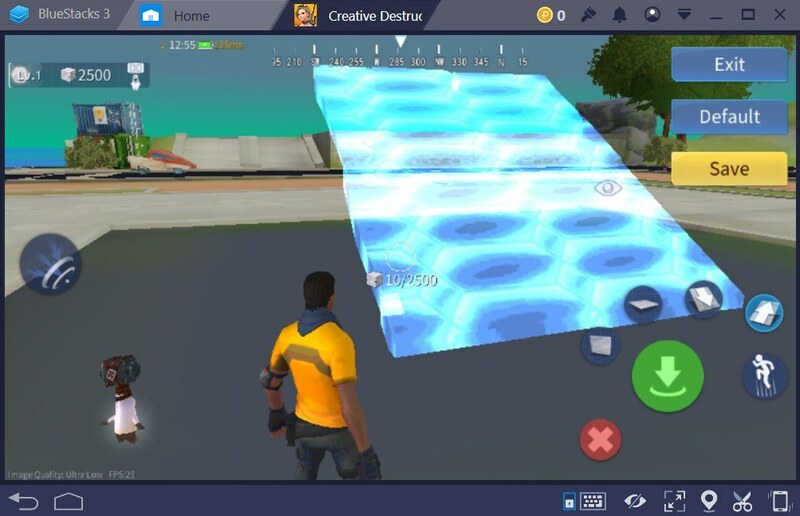 However, don’t be scared, BlueStacks is ready to help you, check out The BlueStacks Guide for Creative Destruction here to get more details. Open BlueStacks controls and configure your building controls to your liking. When you launch the game for the first time, you will see that some of the building blocks are not assigned to a keyboard key. So make sure to fix that. Assign a key for every building block and build using your keyboard buttons with ease. When you are in a match you will realize that not many players bother with the building. But with the help of BlueStacks, you will always have the upper-hand. Developers of Creative Destruction probably knew how hard would it be to build on mobile phones. So they added this auto-build option that you can only utilize a couple of times per match. By using this auto-build skill, your character will automatically build a bunker that will protect you. This bunker can be used only a couple of times per match as mentioned before. So be hesitant before using it; wait for the best moment, observe your surroundings – and if you think you are in real danger, just go for it. To be able to use it instantaneously, utilize BlueStacks control configuration and assign the best suitable button for it. When things go rough, just click on the assigned button and an enormous bunker will appear to protect you. Practice makes perfect. 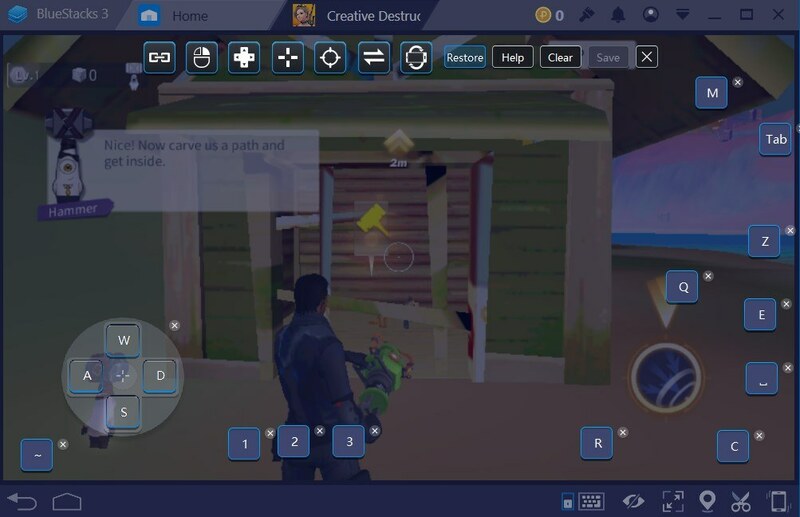 Yes, it’s hard to build, we stated that more than enough until now, but get this, there is a custom building mode in Creative Destruction that you can utilize whenever you want. Just head in there and start practicing/building. You can build anything by using your imagination or you can try to build default projects laid out before you by the developer team of Creative Destruction. Alright, we are going to practice our building but this game isn’t only about being an architect. There are many other aspects of Creative Destruction that need to be mastered. Using your parachute efficiently, looting, knowing where to drop, shooting, and many more different things will need your max attention. Training modes are nothing new to video games. Creative Destruction has a well-made and exhaustive training mode that will ready you up for the battlefield just like many others. In the training mode, you can start from the very basics such as landing, or just go for the advanced training modules that are more suited for the veterans of the genre. Whatever your skill level is, there is no harm from any sort of training. Let’s talk about the controls a little bit. Thanks to BlueStacks, you will be able to use your mouse and keyboard for the most optimal gameplay. When you launch a game using BlueStacks for the first time, the controls will be modified. 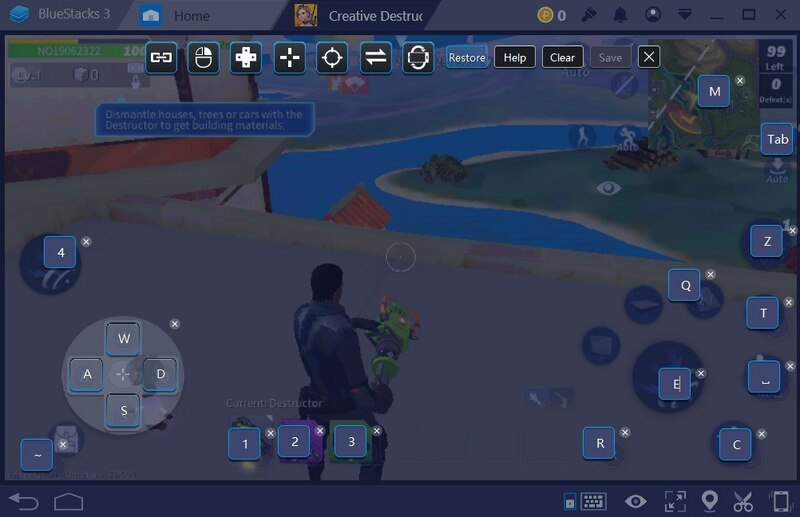 However, because there are too many controls on Creative Destruction, you will need to configure it yourself for the best result. Assign the most suitable keyboard buttons for your gameplay. Some essential controls can’t be disregarded, such as the bunker button. Tinker around and find the best configuration settings. Better controls mean better gameplay. One of the most important buttons in any shooter or battle royale game is the ‘auto-run’ button. Every mobile gamer surely knows how cumbersome it is to hold your fingers on screen to keep running. 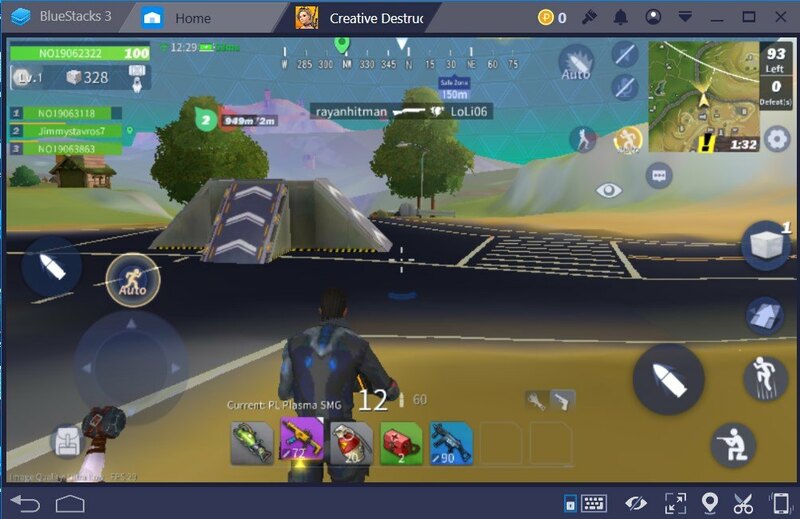 When you launch Creative Destruction on BlueStacks for the first time, the auto-run button won’t be assigned to a keyboard key. Be sure to assign a button to it and utilize it for longer distances. There is nothing more frustrating than having to hold a button on a touch screen for such a long time. Looting is an essential part of any battle royale game. There isn’t a bigger turn-off than clunky looting control where you are forced to waste time while looting. Efficient looting means better gameplay. 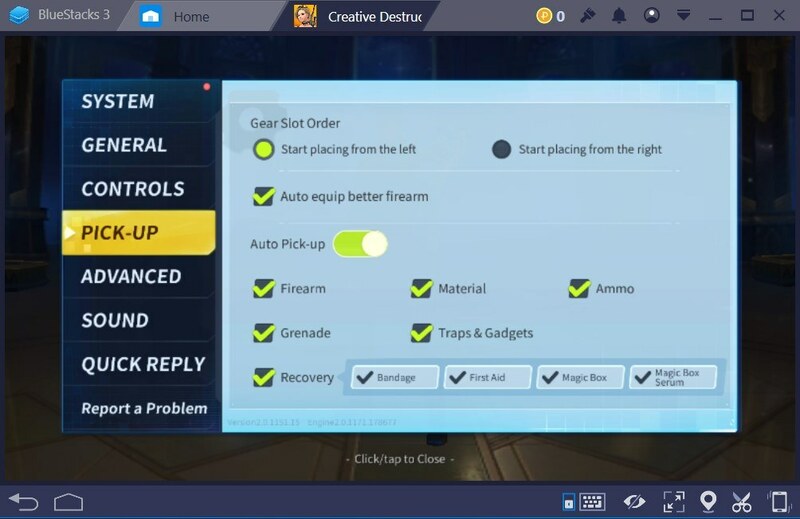 To not waste time while playing Creative Destruction, you need to enable auto-picking in settings. When this is enabled, your character will pick up the most essential items and a better version of your current items automatically. You won’t have to weed out what is best, just go over the loot and you will equip the best items. Creative Destruction is a fun and engaging mobile battle royale game. It borrows many similar ideas from its competitors but manages to remain different positively. Apply these tips and tricks to enhance your gameplay. Utilize BlueStacks and have the upper hand against your foes. When you utilize these tips and take advantage of BlueStacks, maybe you will get your first win in your first game just like us. Good luck destroying, albeit creatively. PUBG, CrossFire or Creative Destruction? Which one to Play?